In this plot you can see we started some 5km from the start of the Col du Marie Blanque, which starts fine, but the last 5km is relentless. 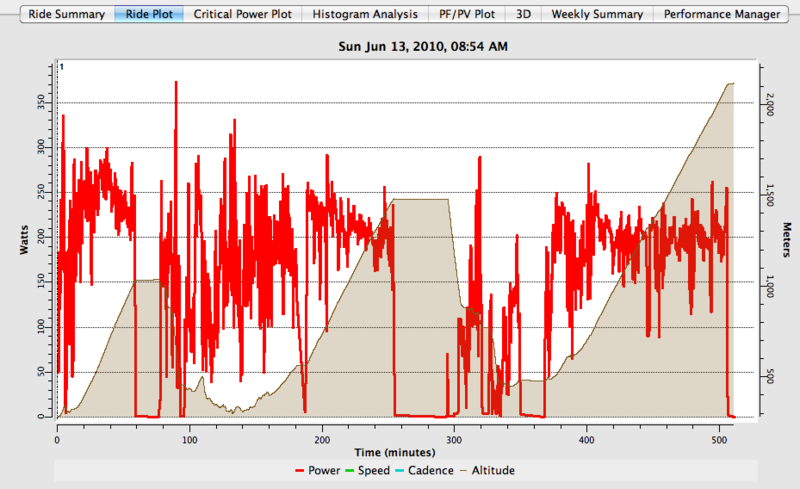 I got to rest at the top of each of these climbs, with hot coffee and biscuits, I suspect I won’t have that on the day. One other thing, we drove the 50km or so to the bottom of the Marie Blanque, but it includes a few decent climbs – over 500m in all, so don’t hurry that section or you’ll doe before reaching the top of the Marie-Blanque, let alone completing the rest. You mentioned that you did the etape using the 705. Did you load in a route to show waypoints etc. The reason for asking is that I have recently got a 705 and plan to use it for the etape. I have no fear of getting lost (of course), but knowing my progression with regard to timelimits would be really helpfull. i.e It would be good to know how close I am to cut off times. Nice to know that somebody actually finds the posts, and even reads them! I do have a gpx and tcx of the course. I don’t actually have a 705 myself, that may be on the list for next year (along with hiring the CycleOps powertap wheel) so I’m not sure what to do with them. If you know what to do with them, happy to share. Good luck. We’re off to do the route of the Chiltern100 this weekend – plus a bit extra – total of 2279m (mabye). I’m hoping the rain is over with today. Thanks Badger, Hope the Chiltern route went well. I did the event this year, it is a great route with some awesome climbs. Cheers for the files, although I cannot actually access them. Where did you get them from orginially? I may need to go to the source.